A Navy team from the USS Essex outpointed a Marine Corps Recruit Depot squad Wednesday morning for bragging rights at the annual NFL “Boot Camp” at the Miramar Marine air station. 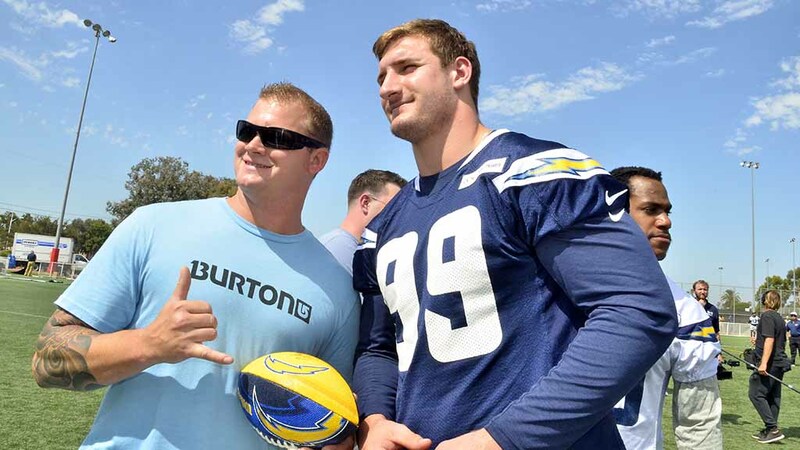 But bagging rights were a bigger draw — as in bag autographs of Phil Rivers, Antonio Gates and other Chargers stars. Among the Bolts was top draft pick Joe Bosa, making one of his first local appearances. The former Ohio State star ended his holdout Monday when he signed a four-year contract. The defensive end was among those staying the longest Wednesday to meet the fans. 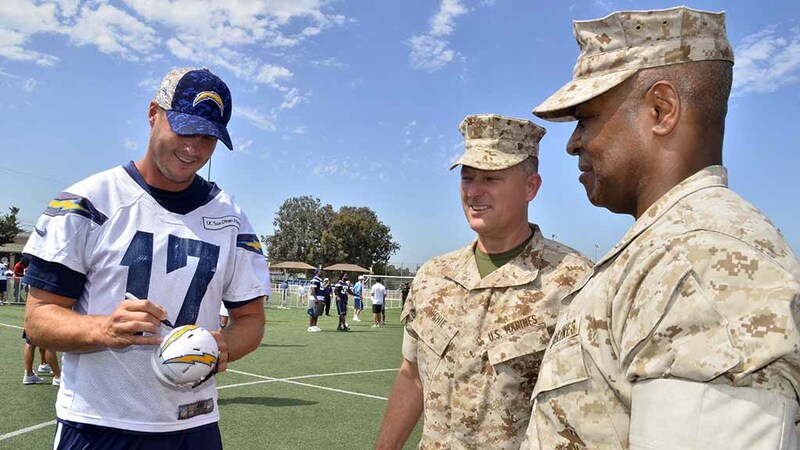 The Miramar Sports Complex Field saw five-member teams from the Army, Navy, Marines and Coast Guard take part in a series of NFL-style drills and skills. About 50 competed — all getting free admission to Thursday’s 49ers game at Qualcomm Stadium. But he really looked forward to meeting what he called future Hall of Famers — Rivers, Gates and perhaps others. Marine Sgt. Michael Rivas — a high school quarterback in Maryland — looked forward to the throwing and catching drill. “Doesn’t quite compare (to boot camp),” he said with a laugh. Coast Guard Lt. Cmdr. Ellen Motoi called the event a great time to interact with new shipmates, and Army Sgt. 1st Class Joy Shrestha said her team needed a woman. “Only two females in the building, and we’re here today,” she said. Emilee Forrester of the Naval Base San Diego-ported USS Essex recently arrived after basic training at Naval Station Great Lakes, the boot camp in Illinois. She said it was “very awesome” to mix with the large contingent of Chargers. The event was co-sponsored by USAA, the Texas-based financial services company that caters to military.